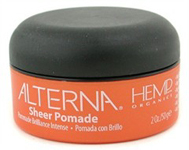 Alterna Hemp Organics Shine Sheer Pomade is water based and lightweight finishing pomade that smoothes and defines your hair without weighing it down. It works great with damp or dry hair to gives you gentile control and a high shine finish; it increases elasticity and manageability, and adds volume. Enriched with Hemp Seed Oil, Essential Amino Acids, and nutrients it helps protect against breakage and damage. Free of Phthalates, Paraffin, Mineral Oil, Synthetic Color, DEA or TEA.